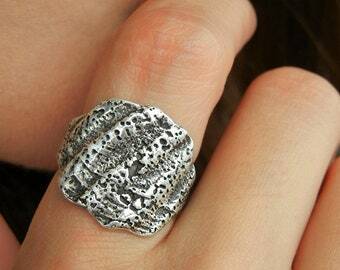 Rustic Silver Ring, Silver Tree Bark Ring: A sterling silver unisex rustic ring of replicated real tree bark is heavily oxidized and hand spot polished to accentuate the detail of the wood grain with all its rugged fissures and striations, an organic texture drafted by Mother Nature and worn by you. Stamped into the bark your initials, your lover's, or your initials + their initials. Your custom silver bark ring will be like the one pictured, yet vary slightly in the pattern as each are hand made and will reverberate their own intrinsic charm. Delightfully unique & unisexy with a dose of woodlands mystique, a ring a fairy would wear, if I could make one tiny enough. 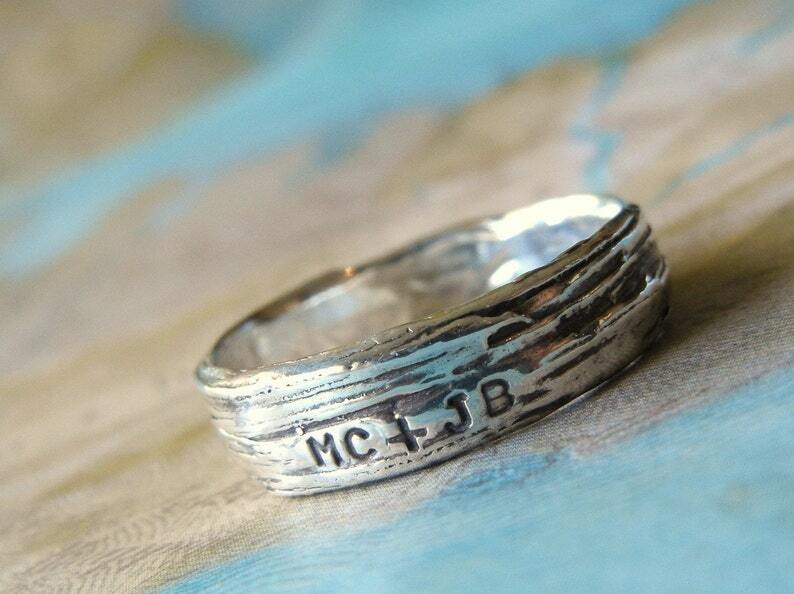 The perfect personalized wedding band or friendship ring, a cool hand made heirloom quality solid sterling silver piece of jewelry. >>> This listing is for ONE silver bark ring. <<< Other jewelry is shown as examples of our work, offered for layering and stacking inspiration, and can be purchased in our shop. See links below. Available in whole & half US sizes 4-15. See drop down menu for pricing in your size. Love this! Beautiful, well made item, smooth transaction, quick shipping. ma femme adore le motif "bois flotté"
ma femme adore le dessin "bois flotté"